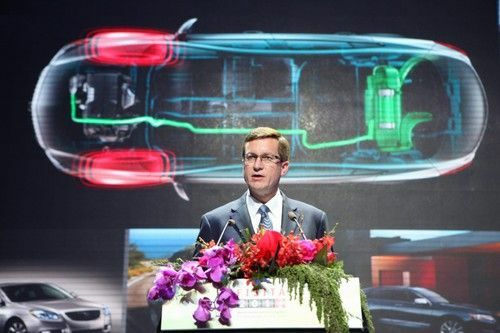 In Beijing on Tuesday, Jon Lauckner, GM Chief Technology Officer, vice president of Global Research & Development, and president of GM Ventures, told the FISITA 2012 World Automotive Congress in Beijing that “China has made electrification a key strategy. Electrified vehicles will play a critical role in efforts to conserve and ultimately displace petroleum as the major source of transportation energy.” The speech underscored several years of investment by GM in factories, research centers, and joint partnerships in China, some of which focuses on electrified vehicle development. GM's presence in China was made into a politicized controversy during the just-ended election season, but GM has been open about what they're doing in China, building and selling vehicles as a properly globalized megacorporation that builds products where it sells them. Lauckner's speech focused on GM's research and development of electrified vehicle technology. GM's goal is to increase the energy density and decrease the cost for electrified vehicle battery packs. This will make those battery packs lighter than current ones, and decrease the price of electrified vehicles making them more attractive to consumers. “Greater adoption of electrified vehicles requires a greater breadth of offerings; cost reductions in technology for more competitive pricing compared to conventional vehicles; and, of course, more infrastructure for convenient charging,” Lauckner said. Energy density is the amount of power (kilowatt-hours) stored in a battery of a given weight or size (either kilowatt-hours per kilogram, or kilowatt-hours per liter). GM has dropped a few hints that they'll be selling a 200 mile range electric car in a couple years. Those hints appear to be based on R&D collaboration with Envia Systems, a company that GM Ventures has invested in, and which has its own operation in China. Envia is claiming to have developed battery technology offering a 400 Watt-hour/kilogram energy density at the cost of $125 per kiloWatt-hour, which would dramatically change the cost/capability ratio of electric cars. Lauckner also spoke about GM's research into applying electrification and connected vehicle technology to urban mobility solutions. Many of the automakers see crowded urban areas, due to rapid population increases, as harkening a future mobility terrain that has to be very different than today's. GM showcased, at the FISITA 2012 World Automotive Congress in Beijing, a vision for sustainable urban transportation through products such as the EN-V (Electric Networked-Vehicle) concept. GM's presence in China became a political football during the recently ended election season. Some went so far as to claim GM is becoming "China Motors," or perhaps that GM would shift Chevy Volt production to China, as if that would help paint Pres. Obama's policies as a failure. The fact is that GM is a globalized company with operations all around the world in dozens of countries. China is one of GM's largest markets with sales of over 2.5 million vehicles in China. GM has been openly working on building their presence in China including building a range of business presence including 12 joint ventures, two wholly owned foreign enterprises and more than 35,000 employees in China. In October, Politifact ruled the claims that GM used bailout money to boost China operations were false. What may be most important is GM's view that, in the long term, electric vehicles are here to stay and that they are inevitable. “We will apply innovative technologies to cell design and fabrication, test and validate advanced cell materials provided by suppliers, and ultimately integrate battery cells into future battery systems for our vehicles,” said Lauckner. “We believe the further development of lithium-ion battery technology is possible through improvements in cell chemistry, cell and pack design, and optimization of thermal management.” In other words, GM's engineers are hard at work solving the technological hurdles to electric vehicle adoption.